When you are ready to build up your inventory for your inflatable rental business, it is important to keep a few things in mind. Before you buy commercial inflatable bouncers and slides, read this article. Competition’s Inventory: This may seem like an obvious step to some, but it is important to do some research on your competition. For example, if the company has a website, take a look at the products and services they offer. You will need to offer similar products and services in order to compete. In addition, you may notice some product or service opportunities that other companies do not offer. This way, your business will have the upper hand. This type of research will also allow you to navigate the price range in which you should be operating in order to stay competitive. Quality of Inventory: It may initially seem like it’s a huge investment to buy commercial inflatable bouncers and slides. The truth is, it is more wise to purchase with quality in mind. For example, purchasing a cheap bouncer that has been imported from China may sound appealing at first. What if your bouncer breaks down after a few months? You will not have many options in terms of warranty or repair services. If you want to buy commercial inflatable bouncers and slides, it is better to make your purchase from a reliable, professional company. Ultimate Jumpers, Inc. is an inflatable manufacturing company that has been in business for almost a decade. They offer a wide range of commercial inflatable bouncers and slides which you can view here. 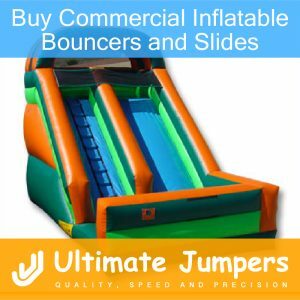 In addition, all inflatable units purchased from UltimateJumpers.com are backed with a warranty. In addition, they offer an incredible financing program which allows the business to pay back for their equipment in small payments.